Welcome to the Thursday Twister, -- our weekly session of crossfit for the mind. Today I want to ask the question -- what car announces to the world that you have given up? If you ask me...and you did...the ultimate I've given up on life car is none-other-than Chrysler's PT Cruiser. Even the name screams of post carpal tunnel surgery therapy mixed with budget cruise line vacations. 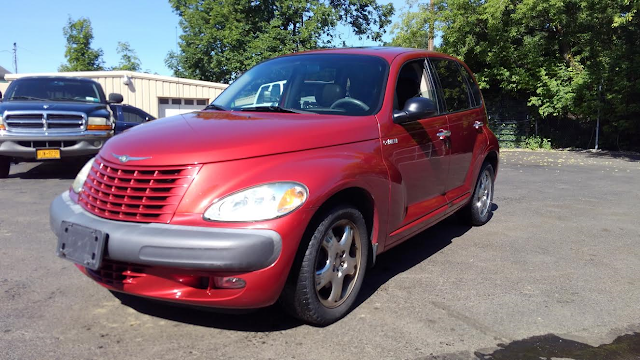 I don't even want to look at one, but you can get this 2002 Chrysler PT Cruiser here on eBay offered for $2,995 buy-it-now or make-offer. What is the four-wheeled equivalent of middle-aged grown-ups going to Disneyland for a birthday? To me the Prius is the furthest thing away from anything I ever want to own. When I drive one it feels like a joke. My neighbor wanted to chat me up about his new Prius and I told him straight up I rather go see a proctologist. I'll rock any car out there. However a sure sign that I've given up is if it's dirty. Dirty car = sweatpants or cargo shorts to dinner at a sit-down restaurant. My cars (two right now, a 1996 Land Rover Discovery and a 2016 Mazda CX-5) are always washed, waxed and the interiors are clean. The day there's an empty drive-through soda cup or envelope from the mail in my floorboards will be the day I'm announcing I need to be taken to pasture and shot. A beige Camry that's less than 10 years old. I say any car with the addition of a bumper sticker stating my kid is on the honor role & yours isn't. Thank god my kids are just average & I don't have to disappoint them by not applying it to my car. https://imgur.com/a/oGOOJ Honestly, I know I'm probably gonna get a lot of flack for this, but please have some charecter in your car, we don't need another mindless econobox on the road. There are plenty of economic options to look at when buying a car that are still inexpensive, but have charecter, have charm, something of which these cars and ones like it have literally none of.